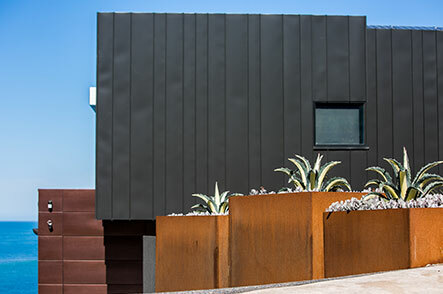 A new build comprising of three levels cut into a steep seaside site at Somers on the Mornington Peninsula. This project commenced with a bulk excavation, boundary piling and retaining walls. the lower ground floor is on a slab on ground with core filled blockwork, which is cut into the hillside is made up of home cinema, steam/powder room, indoor/outdoor living. The area can be opened up with expansive sliding doors, bringing together the swimming pool outdoor kitchen and living areas. The midlevel includes the main entry to the home and garage. This breaks the bulk of the structure from the street scape and brings guests into the main living, kitchen area. the counter livered stairs allow view lines through to the bay and down to the pool. As one enters this space, the view grows into a panorama over Western Port Bay. The upperfloor encompasses study/library and master bedroom, WIR and ensuite. The other three bedrooms are spread throughout the home, creating private spaces. A curved central wall provides a subtle spine to the home. It also breaks the boundaries of internal external space with the reflective sheen of the external tile mirroring the internal white stair well. Every room in this house takes advantage of natural light and the spectacular location and pprovides view lines through to the water. Some areas including the study and guest bedroom use secondary view points through adjoining rooms. The study uses the highlight atrium windows nad the main living room window to provide an additional view line to the water edge below.